This chapter covers best practices in creating web content that is compatible with Safari on the desktop and Safari on iOS. Many of these guidelines simply improve the reliability, performance, look, and user experience of your webpages on both platforms. If your target is iOS, the first step is to get your web content working well on the desktop. If your target is the desktop, with minimal modifications, you can get your web content to look good and perform well on iOS too. iOS Note: When designing your webpages, be aware of how Safari on iOS presents webpages to the user and how the user interacts with your webpages using gestures to zoom, pan, and double-tap. Read iOS Human Interface Guidelines for metrics and tips on designing user interfaces for iOS. The first design rule is to use web standards. Standards-based web development techniques ensure the most consistent presentation and functionality across all modern browsers, including Safari. A well-designed website probably requires just a few refinements to look good and work well on Safari. Refer to Safari reference documents, such as Safari HTML Reference and Safari CSS Reference, for availability of features on specific platforms. You should follow well-established rules of good web design. This section covers a few basic rules that are critical for Safari. Web Page Development: Best Practices for more general advice on designing webpages. Add a DOCTYPE declaration to your HTML files. Preface your HTML files with a DOCTYPE declaration, which tells browsers which specification to parse your webpage against. See HTML Basics for how to do this. Your webpages are more maintainable if you separate page content into distinct files for mark-up, presentation, and interaction. You increase cross-platform browser compatibility by running your HTML files through a validator. You should fix common problems such as missing quotes, missing close tags, incorrect nesting, incorrect case, and malformed doctype. See http://validator.w3.org or use the validator provided by your web development tools. Read HTML Basics and CSS Basics for how to write structured HTML and add CSS to existing HTML. iOS Note: Note that the Diffie-Hellman protocol, DSA keys, and self-signed certificates are not available on iOS. 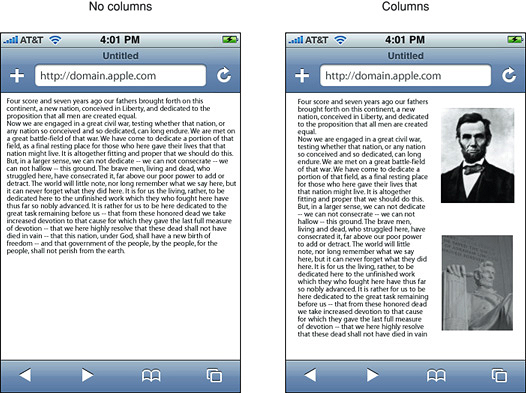 To be compatible with iOS, use columns and blocks to lay out your webpage like many online newspapers. This makes your webpage more readable and also works better with double-tap to zoom on iOS. Text blocks that span the full width of the webpage are difficult to read on iOS as shown on the left in Figure 1-1. Columns not only break up the webpage, making it easy to read, as shown on the right in Figure 1-1, but allow the user to easily double-tap objects on the page. When the user double-taps a webpage, Safari on iOS looks at the element that was double-tapped, and finds the closest block (as identified by elements like <div>, <ol>, <ul>, and <table>) or image element. If the found element is a block, Safari on iOS zooms the content to fit the screen width and then centers it. If it is an image, Safari on iOS zooms to fit the image and then centers it. If the block or image is already zoomed in, Safari on iOS zooms out. Your webpage works well with double-tapping if you use columns and blocks. Read CSS Basics for how to add CSS to existing HTML. You also need to size images appropriately. Don’t rely on browser scaling. For example, don’t put a 100 x 100 image in a 10 x 10 <img> element. Tile small backgrounds images; don’t use large background images. Use windows and dialogs supported by Safari on iOS and avoid the others. iOS Note: Note that the showModalDialog method is not supported in Safari on iOS. Be aware of the features you get for free in Safari on iOS by using supported content types and elements that tailor the presentation of content for small handheld devices with touch screens. In particular, Safari on iOS handles content types such as video and PDF files different from the desktop. Safari on iOS also has the ability to preview content types and launch another application if it is available to display that type of document. 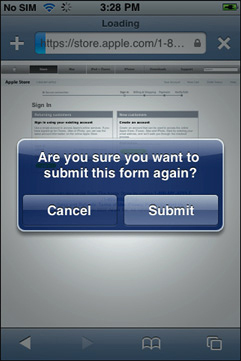 Following links such as phone numbers in your web content may launch applications too. 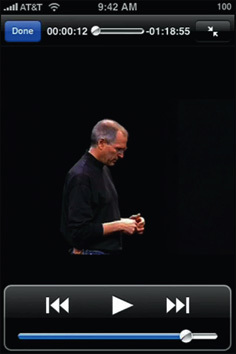 On iPhone and iPod touch, the video and audio is played back in fullscreen mode only. The video automatically expands to the size of the screen and rotates when the user changes orientation, as shown in Figure 1-3. The controls automatically hide when they are not in use. On iPad, the video and audio is played either inline in the webpage or in fullscreen mode. Read Creating Video for how to export video for iOS. 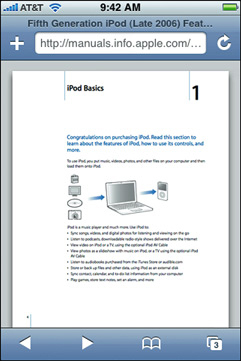 PDF documents are easy to view using Safari on iOS and even easier to page through as shown in Figure 1-4. PDF documents linked from web content are opened automatically. The page indicator keeps track of where the user is in a document. And just as with video, the user can rotate iOS to view a PDF in landscape orientation. Safari on iOS previews other content types like MS Office (Word, Excel and PowerPoint), iWork (Pages, Numbers, and Keynote), and RTF documents. If another application registers for a content type that Safari on iOS previews, then that application is used to open the document. For example, on iPad, Pages may be used to open Word and Pages documents that are previewed in Safari on iOS. If another application registers for a content type that Safari on iOS doesn’t support natively or preview, then Safari on iOS allows the document to be downloaded and opened using that application. When the user taps certain types of links, Safari on iOS may launch a native application to handle the link—for example, Mail to compose an email message, Maps to get directions, and YouTube to view a video. If the user taps a telephone number link on a phone device, a dialog appears asking whether the user wants to dial that number. On the desktop, most of these links redirect to the respective website. Read Apple URL Scheme Reference to learn more about using these types of links in your web content. iOS Note: Note that Java and Flash content types are not supported. See Don’t Use Unsupported iOS Technologies for a complete list of unsupported technologies. You can use the same canvas object used by Dashboard widgets to implement sophisticated user interfaces for web applications. The canvas object was introduced in Safari 2.0, is adopted by other browser engines, and is part of the WHATWG specification. Read WebKit DOM Programming Topics to learn more about using the canvas object. You can use the HTML5 audio and video elements to add audio and video to your webpages. On smaller devices like iPhone and iPad touch, the movie plays in full screen mode only and automatic playback is disabled so a user action is required to initiate playback. On iPad, the video plays inline in the webpage. When the video is played inline, you can create custom controls and receive media events—for example, pause and play events—to enhance the user experience. Use the HTMLMediaElement class and its subclasses, described in DOMElement Additions Reference, to do this. Read Safari HTML5 Audio and Video Guide for more in-depth information on the audio and video elements. Read Creating Video for how to create media files compatible with Safari. Table 1-1 lists the rich media MIME types supported by Safari on iOS. Files with these MIME types and filename extensions can be played on iOS. The user cannot "mouse-over" a nonclickable element on iOS. The element must be clickable for a mouseover event to occur as described in One-Finger Events. Since a mouseover event is sent only before a mousedown event, hover styles are displayed only if the user touches and holds a clickable element with a hover style. Read Handling Events for all the events generated by gestures on iOS. Similar to hover styles, tooltips are not displayed unless the user touches and holds a clickable element with a tooltip. Safari on iOS is not a miniature web browser—it is a full web browser that renders pages as designed—therefore, there is no need for Safari on iOS to support Wireless Markup Language (WML). Alternatively, it does support XHTML mobile profile document types and sites at .mobi domains. <!DOCTYPE html PUBLIC "-//W3C//DTD XHTML Basic 1.1//EN"
Safari on iOS supports file uploading—that is, <input type="file"> elements—on iOS 6 and later. iOS Note: The HTML contenteditable attribute is supported in iOS 5.0 and later. In earlier versions, replace contenteditable, used to enable text input within a styled element, with a styled textarea element. In Safari, you can customize the appearance of textarea elements using CSS. If necessary, you can even disable any platform-specific, built-in styling on a textarea element by setting -webkit-appearance to none.